Rapid Wrinkle Repair Eye Cream: Includes Retinol SA, Glucose Complex and Hyaluronic Acid and promises to repair the skin under your eyes in just one week! Ultra Gentle Daily Cleanser: Formulated with a hypoallergenic fragrance and helps to protect skin's natural moisture barrier. Plus, it's one of my favorite products! All-in-1 Acne Control Facial Treatment: Salicylic acid works to keep pesky pimples at bay in this spot-fighting gel. Plus a $25 American Express Gift Card! This giveaway has a retail value of $128! Here's how to enter. NOTE: PLEASE ONLY LEAVE ONE COMMENT! Do not leave additional comments about Facebook, Twitter and Pinterest entries or mention them in your one comment – those are counted separately and you do not need to mention them here. Thanks! 2) Like The Beauty of Life on Facebook and leave a comment on the Facebook post about this giveaway telling me why you want to win this Neutrogena gift basket. This giveaway ends on Monday, December 17 at midnight. One winner will be chosen AT RANDOM on Tuesday, December 18. Maximum of FOUR ENTRIES (one for each way listed above). Multiple entries will be disqualified. Giveaway is open to US residents only. This would make the perfect skin care regimen...I love that it includes an acne product too! Rapid Tone Repair Night Moisturizer looks amazing! I've never tried these particular products from Neutrogena so I'd be really appreciative to win this basket. Following on FB, Twitter & Pinterest. Tweeted and re-pinned contest. Left comment on your FB page under the giveaway post. I love Neutrogena facial cream. 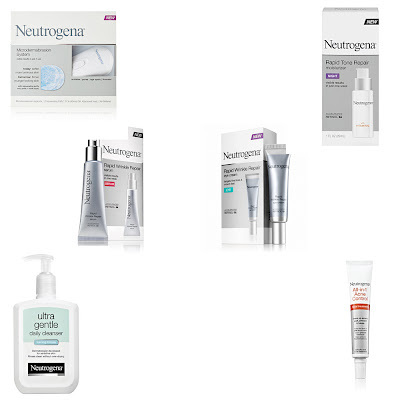 At 36 I've been upping my skin care regimen over the past 2-3 years and this wonderful Neutrogena selection could save me a small fortune in EXCELLENT and well-renowned brand skincare!! My skin would thank me ! I can't imagine a more perfect contest to win! Thank you for offering it! Oooh La La I'd love to win this! Looks like a great way to try microdermabrasion! Thank you for the opportunity dear! i just moved to minnesota and my skin is going crazy! this would be a lifesaver. Nice products, I've heard that cleanser is really good. Omg I need this! My skin is a mess lately! Winning this would be amazing!